When I was in sixth grade, DC Comics killed Superman. A few months later, Batman’s back was broken. The cover prices of comic books began to soar, mostly due to foil embossed collector’s edition covers. About the same time, Image comics began producing ultra violent anti-heroes with steroid-like bodies, gargantuan guns and flanked by women with colossal breasts. All of these factors designed to titillate my adolescent mind actually worked against the comic book publishers and I was completely turned off to comics. Yet, I received a Scholastic Books order form in school with a place to order a book called “Maus”. I studied the description of the book and the small sample image taken from the interior pages. Hmmm. 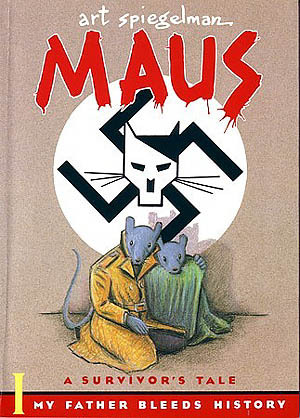 A book about the holocaust that depicts the Jews as mice the Nazis as cats. That smacked of allegory or metaphor or one of those literary concepts we had been discussing in my “Reading” class. And still wanted to like comics. This looked like a comic that was 180 degrees from the Death of Superman. This was about real people. Real wars. Real chaos. Real evil. I filled out the form and received the book a few weeks later. I devoured it in a weekend. The next week I read it again. Every time I read it I found something new. One time, it was an interest in howSpeigelman drew in a raw crosshatched style. The next time, it was Artie’s relationship with a father who has been to hell and lived to tell about it, yet also carries all sorts of neurosis that come from having to constantly hide and make deals to survive. The book made me realize that death and evil didn’t have to be dealt with in such a caviler manner as the “heroes” of DC and Image did; dying one day and being resurrected months later for a cheap plot gimmick and increased sales. I’ve read Maus at least a dozen times- maybe more. It still makes me cry in places. I still find new things in it. It is a masterpiece that inspires me to make comics that mean something. This entry was posted in almanac, Recommended Reading and tagged Art Spiegelman, comic books, comics, graphic novels, holocaust, Maus, memoir, World War II. Bookmark the permalink.